During the first days of the internet, searching for information was often a mixed bag. Early search engines executed a search-and-find algorithm, a step-by-step method of solving a problem, which sometimes returned webpages that had very little relevance to the user’s desired content. One of Google’s founding members, Larry Page, changed the game by developing an algorithm now referred to as PageRank™. The algorithm exploits the interconnectivity of the internet to rank webpages. The more times a webpage is referenced across the internet, the higher its rank is. Higher rank webpages are, therefore, more likely to be pertinent to the user’s search, as they have several votes of support that correspond to a more likely relevancy. As it turns out, PageRank™ has broad application potential. Because PageRank™ is a technique that exploits networks, other systems that exist as a network could potentially benefit from the use of the algorithm. One such system exists in chemistry. 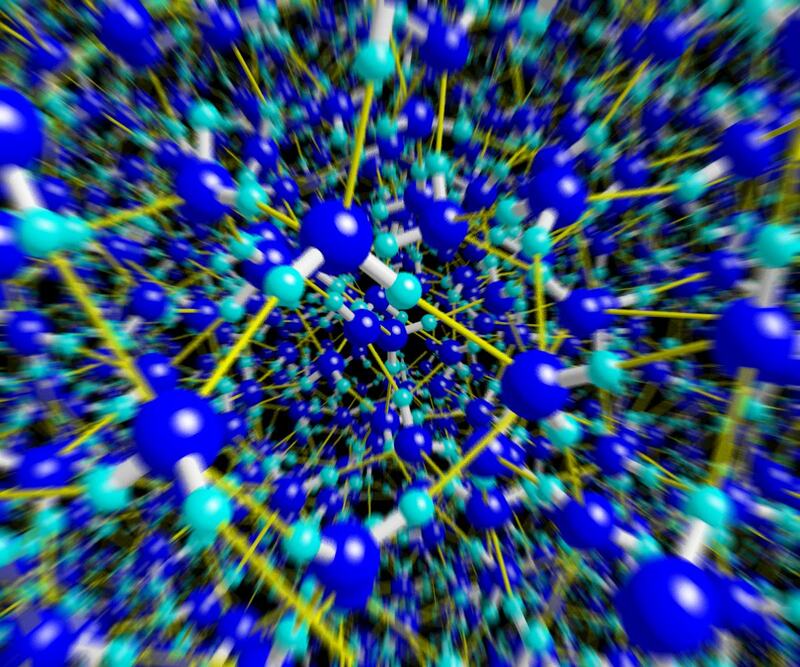 Atoms forming bonds to create a molecule is a type of network, and at a larger scale, so too are the interactions between the many molecules that make up the liquids and solids that surround us. This has led scientists within the Interfacial Dynamics in Radioactive Environments and Materials (IDREAM) Energy Frontier Research Center (EFRC) to use PageRank™ to study the patterns in these chemical networks to better understand the chemical reactions that occur within nuclear waste. An outstanding problem in nuclear waste produced for defense purposes is the transformation of aluminum hydroxide from a liquid to a solid. This transformation proves problematic when trying to remove nuclear waste from tanks, as it can plug pipes. Therefore, understanding the change is pivotal in understanding how to dissolve, and keep dissolved, the aluminum-containing compounds in nuclear waste left over from the metal cladding and chemical processing of nuclear fuel rods. To complicate matters, the aluminum species exist in a hostile environment. Such complications form complex extended networks of interactions that can strongly influence the transformation of aluminum. Thus, within the nuclear wastes studied by the IDREAM team, the chemical reactions involve complex changes to large groups of molecules and atoms—an ideal situation for using the PageRank™ algorithm. When considering a chemical network, scientists can use PageRank™ analysis to uniquely describe both the nearby and far away patterns around specific atoms or molecules, such as bond distances and angles between atoms. This means that PageRank™ can describe the chemical environment about an atom or a molecule. As the environment around an atom or molecule changes during a chemical reaction, the surrounding connectivity—and, therefore, the PageRank™—will correspondingly change. 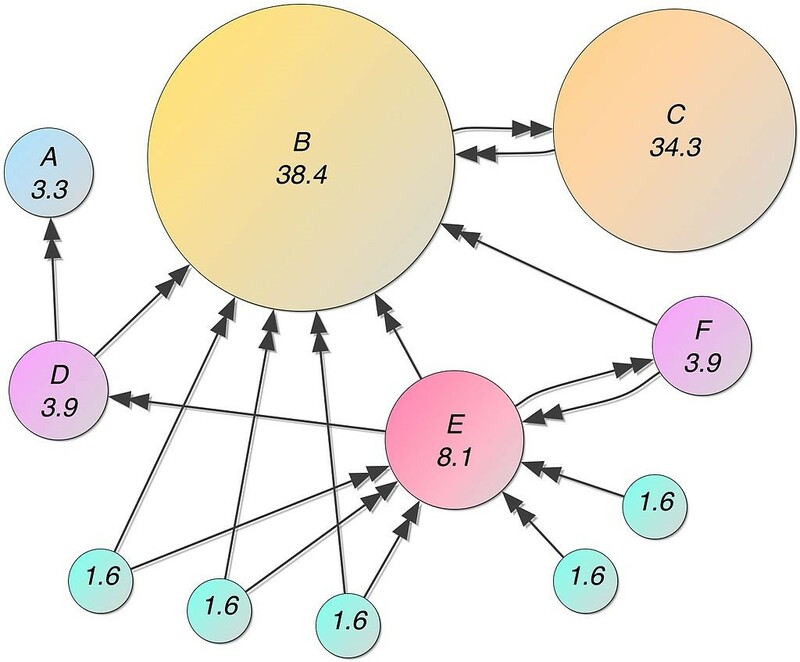 Recent research has highlighted that PageRank™ can track complex changes that occur during a chemical reaction by tracking the connectivity of the system. The power of this method is that all of the complexity of a chemical reaction can be reduced to the change in the PageRank™ value over time. Initial efforts focused on adapting and validating the PageRank™ algorithm to describe the molecular shape of a chemical system. It is important to first study a relatively simple geometry to verify that PageRank™ can be applied to study reactions happening in nuclear waste. Once validated, the group started to realize the true potential of using the PageRank™ algorithm. Studying complex systems is quite difficult, and computational techniques such as PageRank™ are an important part of finding answers to aluminum and other nuclear waste issues. “Using computational concepts to understand the physics and the chemistry behind complex phenomena is very popular these days, and more importantly, it’s changing the traditional way in which we think about fundamental physical concepts and processes,” said Martinez-Baez. In some ways, powerful computational techniques are one of our best hopes for understanding the incredibly complex systems that make up everyday life, he opined. While great strides have been made to further the application of PageRank™ within IDREAM, there is still quite a bit of work to be done. The algorithm was not designed to look at chemical systems, and employing PageRank™ within IDREAM is not always a straightforward task. “There are many unsolved questions still with respect to PageRank’s implementation and applicability, and we are looking forward to expanding our knowledge base and to pushing the boundaries of its functionality,” said Martinez-Baez. Looking at reactions happening at complex solid-liquid and liquid-liquid interfaces, and extending the PageRank™ algorithm to study of chemical reactions’ transition states are some of the foreseeable tasks for IDREAM. The IDREAM team has, so far, seen great success with implementing the PageRank™ algorithm into its research, and they encourage other researchers to give it a try. “Conceptually,” said Martinez-Baez, “networks and PageRank™-related concepts have limitless applications.” An algorithm originally designed to bring people the most relevant webpage can, therefore, have a large impact on how scientists deal with the incredibly complex systems seen in the real world. The Interfacial Dynamics in Radioactive Environments and Materials (IDREAM) Energy Frontier Research Center is funded by the U.S. Department of Energy, Office of Science, Basic Energy Sciences. Patricia Huestis is a Ph.D. candidate studying physics at the University of Notre Dame under Jay LaVerne. She is a member of the Interfacial Dynamics in Radioactive Environments and Materials (IDREAM) Energy Frontier Research Center. Her research focuses on looking at the role that ionizing radiation plays in aging materials located within waste tank environments. Daniel J. Pope is a Ph.D. candidate at Washington State University and a member of the Interfacial Dynamics in Radioactive Environments and Materials (IDREAM) Energy Frontier Research Center. His current research focuses on performing computational studies examining defects in solid-state structures and the role of defects in surface/solution interfaces.